of the third century. It was at the beginning of the fourth century, in 301, that Christianity was first proclaimed as the official religion of Armenia. This proclamation was the result of the missionary activity of St. Gregory the Illuminator (240-332). The fifth century historian Agathangelos recounts the works of the patron saint of the Armenian Church. St. Gregory, a relative of the Armenian king Tiridates (c. 238-314), was brought up as a Christian in Caesarea in Cappadocia. The pagan Tiridates had St. Gregory imprisoned for nearly fifteen years in Khor Virab (“deep dungeon”) in Artashat. Several years later, a group of Christian nuns, led by St. Gayane and fleeing persecution in Rome, came to Armenia. King Tiridates was attracted to one of the women, St. Hripsime, who resisted his attempts to possess her. In his anger, Tiridates had the women killed. After the martyrdom of the women, Tiridates was struck by an illness that turned the king into a wild boar. After all other attempts at curing him failed, the king’s sister St. Khosrovidoukht told her brother that only St. Gregory could cure him. Fifteen years had passed since Gregory’s imprisonment in the dungeon so he was presumed dead. But he was still alive and was released from the dungeon. Gregory cured Tiridates and converted the king and the royal family to Christianity. At this time, Gregory had still not been ordained. In 302, he left for Caesarea, which was an important see at the time, where he was ordained a bishop by Leontius, the Archbishop of Caesarea. Gregory returned to Armenia, baptized the king and the royal family, was installed as the first Catholicos, or chief bishop of Armenia, and continued to convert the Armenian people. Another important event associated with St. Gregory was the vision that he had in Vagharshapat of Christ descending from heaven and striking the ground with a golden hammer. It is at this spot that the Cathedral of Holy Etchmiadzin (“the Only Begotten descended”) was built. Nearby were built the churches of St. Hripsime and Gayane, where the relics of the martyred nuns are kept. With the support of the royal family, Christianity was able to spread quickly throughout Armenia and within just a few centuries to permeate all aspects of Armenian life and culture. Furthermore, Armenian missionaries were sent among the Georgians and Alans, who also subsequently established their own national churches. St. Gregory’s son, Aristakes, succeeded his father as Catholicos. Aristakes had been the representative of the Armenian Church at the Council of Nicaea (325). The Council of Nicaea, the first ecumenical council, set forth the orthodox Christian doctrine of the Trinity. This doctrine is formulated in the Nicene Creed (Havadamk), which is professed every Sunday during the Divine Liturgy. 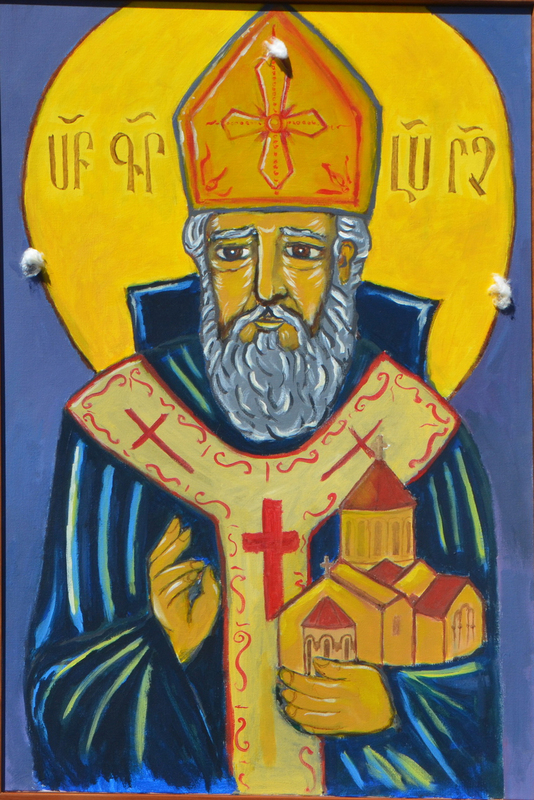 Under Catholicos Nerses the Great (c. 326-373; Catholicos from 353 to 373), monasteries and various charitable institutions were first established throughout Armenia. The year 1953 witnessed the formal establishment of the congregation of St. Gregory the Illuminator Armenian Apostolic Church. The first membership meeting was held on October 16, 1953, where the first Board of Trustees was duly elected with the following members: Ashod Der Minassian, Lemyel Amirian, Frank Korkmazian, Garo Mootafian, Khoren Sahagian, Krikor Daigian, Armen Bazikian and Suren Saroyan. The board then called upon the assistance of several active ladies to form a Ladies’ Auxiliary. The first Divine Liturgy was held on December 27, 1953, in the Serbian church, and Reverend Father Yeghishe Mkitarian, a visiting priest from Fresno, celebrated the service. Mr. Krikor Krouzian directed the choir and Mr. Movses Markarian acted as the deacon. The Board of Trustees felt the need to energize the Armenian youth and bring them closer to the church. In 1954, The Young Armenian Christian League (YACL) was formed under the guidance of the Board of Trustees. Thirty-four youth joined this group. The YACL members were also members of the choir organized and led by Mr. Krouzian, in whose home the rehearsals regularly took place. The choir also created an opportunity for social interaction among young couples who were introduced to one another, some of whom were fortunate enough to find their marital partners. In 1954, with the approval of the general membership meeting, the Board of Trustees appointed a building committee whose prime consideration would be the acquisition of a site suitable for a church. The members appointed were: Messrs. George Mardikian, Lemyel Amirian, Krikor Krouzian, Vahram Haroutounian, Armen Bazikian, Avedis Karageozian, Shavarsh Mazakian, and Sam Harrison. In 1955, after a long and arduous search, the Building Committee submitted four sites for consideration: (1) Jackson and Laguna Streets (2) 14th Avenue and Balboa St. (3) 19th Avenue and Judah St. (4) 51 Commonwealth Avenue. In the interim, and with great difficulties, arrangements were made with the American Episcopalian, Greek, Syrian and Yugoslav churches in which to celebrate our church services. It is with a deep sense of gratitude that we recall the leadership and kind assistance given to us in those trying days by the Board of Trustees, and the priests who conducted the church services from various Armenian church communities, including Father Yeghishe Mkitraian from Fresno, Father Ashod Minassian from Los Angeles, Father Kourken Koudoukian from Los Angeles, and Father Papken Kasparian from Fresno. These priests came alternately every month to celebrate the Divine Liturgy in one of the above-mentioned churches. The need for our own church property reached a crucial point. After an extensive research and study by the Building Committee and Board of Trustees, their findings were presented to the general membership meeting and it was suggested that 51 Commonwealth Avenue would be best suited for St. Gregory the Illuminator Armenian Apostolic Church in San Francisco. In 1956, the membership meeting approved the purchase of the Commonwealth property for $67,500. The building already had a large library that could accommodate 120 people, a kitchen, and a number of other rooms that could house all the sister organizations and a few classrooms. The Board of Trustees decided to temporarily convert the library into a church. Father Vahrich Shirinian was invited to assume the responsibilities of the permanent pastor. He moved to San Francisco with his family in June of 1957. His first Divine Liturgy was celebrated in the temporary quarters of the building on June 9, 1957. Father Vahrich and other parishioners took it upon themselves to transform the library into a chapel and on November 24, 1957, the first service was celebrated in the “church”. The general membership meeting, after hearing the reports of the Board of Trustees and the Building Committee, along with all the sister organizations, voted to adjunct with the Holy See of Cilicia. By a special decree (Gontag) from His Holiness Zareh I, St. Gregory Armenian Apostolic Church officially came under the spiritual and administrative authority of the Catholicosate of the Holy See of Cilicia. Meanwhile, the building committee continued its work in fundraising through banquets and various events to raise funds to pay off loans to build our church. 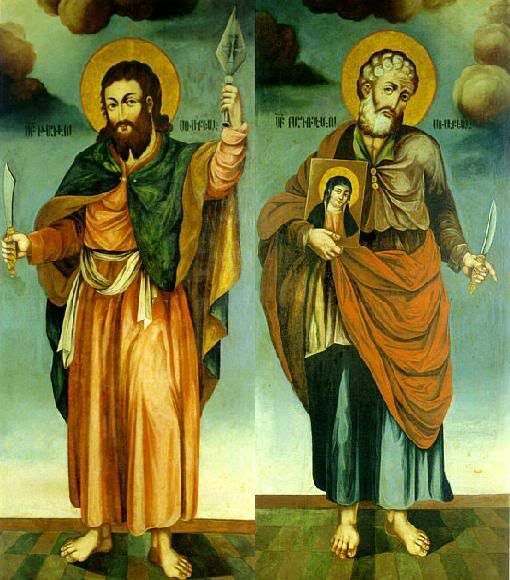 Father Shirinian was assigned to the Encino Parish, and Father Nareg Shirikian then assumed the duties of our church. Immediately after his arrival, Archbishop Hrant Khatchadourian (then Prelate of America) presided over a new building committee for building the church: President Krikor Krouzian; Secretary Sarkis Sarkisian; Treasurer Suren Saroyan; Carl Zekarian and Violet Goliti as advisors. On April 19, 1964, ground blessing services were performed by Archbishop Hrant Khachadourian, and Archpriest Nareg Shirikian with sixteen Godparents of our church. The foundation consecration took place on August 15, 1965. Mr. Tigran Kirakossian, who was a well-known authority on authentic Armenian Church architecture, prepared the design of our church, and construction began the latter part of August 1965. This began the official construction of the church on the adjoining garden to the property. As the community grew, the need for an Armenian Community Center and school became a necessity in order to preserve our language and culture. Another loan was secured from the bank, and the purchase of the property at 825 Brotherhood Way, San Francisco became the new location for the center. Through the tireless efforts of Archpriest Datev Kaloustian , who was our pastor for 26 years, and the new fund-raising committee, headed by Leo Donian, bingo games, and donations from the parish, along with generous donations from Krikor and Melina Krouzian, Carl Zekarian, the first Armenian Day School opened its doors on September 1980, along with the new community social hall. The school was named, The Krouzian-Zekarian Elementary School, and through additional generous donations by Suren and Naomi Saroyan, the social hall was called The Saroyan Hall. Enrollment in the school necessitated the enlargement of the premises, and through the generous donation of Hratch Tarpinian, and another loan from the bank, a second floor was built, which was named, The Vasbouragan Middle School. Through the dedicated efforts of the Bingo Committee and all those who participated in fundraising, and especially by Hank and Rita Khatchaturian, the mortgage was burned and the community center was then named The Khatchaturian Armenian Community Center. It is here that great accolades must be given to the Board of Trustees and the Ladies Auxiliary of our church who have worked side by side with the Pastors and the various committees since the beginning and throughout the years, for the benefits of our church, hall and school, because without their tireless and very dedicated efforts none of this would have been nearly possible. Their charitable and unselfish devotion towards the church is unparalleled. Their compassionate sacrifices and love for its preservation and continuity is a shining example for all of us and for the future generation. Under the spiritual guidance of our new Pastor, Very Rev. Papken Tcharian (now Prelate of Canada) our community experienced a renaissance of commitment and spirituality, and on December 31, 2000, St. Gregory Armenian Apostolic Church was finally debt free for the third time! Soon after many renovations of the church and center were made: the painting of the exterior and interior of the church, a handicap access ramp to the church entryway, renovations of the hall’s restrooms and floors, and landscaping. On the occasion of the 1700th Anniversary of the adoption of Christianity in Armenia, a youth choir, named “Shoghagat”, was started which participated with the regular church choir, and performed especially for His Holiness Aram I, when he visited our community in October of 2000. Through the generous donation of Hank and Rita Khachaturian, a beautiful “khatch Kar” was erected in the church courtyard in dedication to the memory of their parents. It was during this time that our church had the honor of participating with the Bay Area Armenian community in the establishment of the Mt. Davidson Cross as memorial to the Genocide of the Holy Martyrs of 1915, and we continue in its committee. Today, under the auspices of H.E. Archbishop Moushegh Mardirosian, Prelate of the Western Prelacy, our community has St. Gregory the Illuminator Armenian Apostolic Church, the Krouzian-Zekarian Elementary School, the Vasbouragan Middle School, The Khachatourian Armenian Community Center and the Saroyan Hall, of all of which we can be justifiably proud. Our church and school, the two basic foundations of the San Francisco Armenian Community, have provided us with both a spiritual and intellectual light. Their light has woven and molded our granite-like will and indestructible character. We were fortunate in having Archpriest Khoren Habeshian become our Pastor, after coming out of a six-year retirement to serve our church. until a permanent pastor became available. With his kind and loving leadership, we were able to carry on until recently a Vartabed was sent to us from Antelias, Lebanon, Very Reverend Barouyr Shernezian who enthusiastically serves our church today, and has reopened the doors of our Sunday School by the help of dedicated parents from within our community. Our mission is far from finished. We marked the 50th Anniversary of the building and consecration of our church, and as we look to the future, we must strengthen our resolve to involve our younger generation in church and community life. We must inspire our parents and young adults to carry the torch, which has lighted our way through the centuries and continues to foster the nourishment of our spiritual path for generations to come. May God strengthen our path and light our way with His Will to a new future, with new resolve, with new horizons, and with the love of our community.